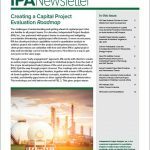 IPA’s early engagement approach helps clients identify capital project risks before entering the more costly phases of project planning. In this new role, Gächter will focus on helping organizations improve capital project effectiveness in the Middle East. Organizations rushing to enter the LNG production and export business in North America are likely to encounter considerable risk. IPA can help in several areas. The annual Industry Benchmarking Consortium delivers metrics and insights to help companies improve their capital project systems. Read highlights of the 2019 event here.